Robert Gardner, Esq., of Manchester, commissioned Denbigh. John Laird, Sons & Co. of Birkenhead was first approached about the project on January 28, 1860. After a correspondence outlining the detailed specifications and terms of payment, the order was confirmed by Gardner on May 15 and acknowledged by the shipyard the following day. The total purchase price of �,150 was to be divided into five equal parts of �030 each, the first installment to be paid by May 19. Subsequent installments were to the paid when the vessel was framed, plated, launched and completed. 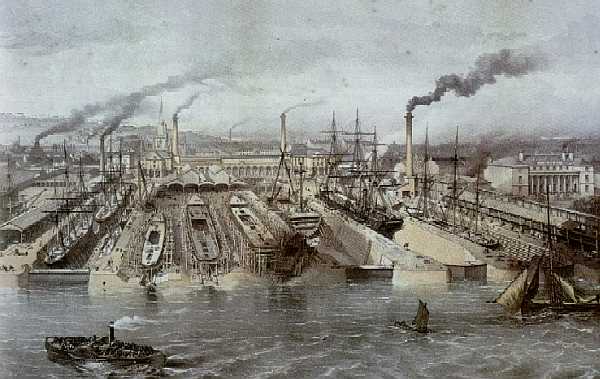 The famous John Laird, Sons & Co. shipyard at Birkenhead, near Liverpool, launched some of the most notable ships of the American Civil War. In 1863 Laird built a pair of turreted, seagoing ironclads that were superior to anything in the Union arsenal. Ever-conscious of its neutrality and already embarassed by the Alabama incident, the British government seized the ships and bought them into the Royal Navy. This 1857 view shows how the yard probably appeared during Denbigh's construction. Denbighs frames were in place by June 14, 1860, and she was launched in August. Denbigh set out for her first trial on Wednesday, September 26. She made two runs, one with the wind and tide and one against. Taken together, the two runs worked out to a "steam speed" of 13.7 knots, with the steamers feathering sidewheels making 38-40 revolutions per minute. For the next three years, Denbigh ran between Liverpool and the Welsh coastal town of Rhyl, in which trade she was (according to one newspaper account) "so favorably known as an extremely fast boat." In September 1863 Denbigh was purchased by the European Trading Company, who planned to run her between the neutral Spanish port of Havana and Mobile, Alabama. The European Trading Company had recently been formed as a partnership between H. O. Brewer Company of Mobile, a commission merchant in that city, J. H. Schroeder and Company of Manchester, England, and Erlanger and Company of Paris. About this same time, Denbigh came to attention of Thomas Dudley, the U.S. consul at Liverpool. 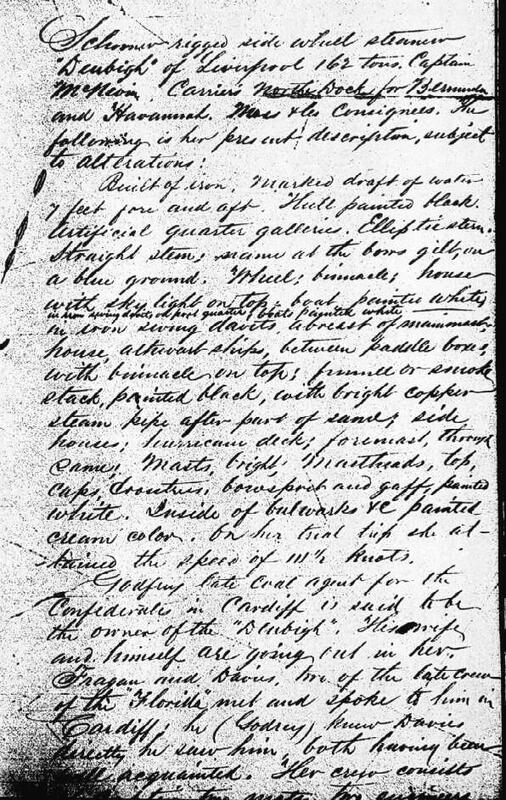 American diplomatic officials in ports throughout the United Kingdom were continually on the watch for ships being converted to blockade runners or Confederate warships; all took detailed notes on them and, in some cases, had them photographed for later identification. The notes compiled by the diplomats were forwarded to the U.S. State Department, which passed them on to the Navy for distribution among the blockading fleet. Dudley prepared a detailed physical description (left) of the paddle steamer, making careful note of her deck equipment, rig, and colors. Denbighs crew, the consul recorded, consisted of the master, two mates, two engineers, six seamen, seven firemen, a cook, and a steward. Finally, Dudley noted that Denbigh sailed from Liverpool on October 19, 1863. Next: Denbigh runs the blockade.